Celebrate all the things we love about fall with essential oil diffuser blends to support physical and emotional health and wellness. FALL IS A SEASON OF TRANSITION AND CHANGE. This time of year is a brief season of equilibrium between summer and winter. The earth is balanced between the two extremes of the year: the Midsummer Solstice, the longest day, and the Midwinter Solstice, the longest night. It’s a time of perfect balance when the weather’s not too hot or cold and days and nights are the same length. This time of year life seems to naturally pause to re-calibrate. Consider taking advantage of fall’s seasonal shift to create a sense of healthy balance in your home and life. This time of year comes with delicious aromas of seasonal baking, soul soothing aromas of mulled cider, and cool crisp fresh air. Warm sweaters, boots and bon fires. What’s not to love. Many say it’s their favorite time of year, myself included. Why not bring a little of the fall outdoors into your home? With essential oils in a diffuser it’s easy to do and the aromas can bring feelings of warmth, comfort and maybe thoughts reminiscent of childhood. I use essential oils daily with roll ons, in my diffuser, and/or massages. I’ve incorporated them into my post-workout recovery, use them to for headaches, to help destress and anytime I’m having a hard time falling asleep. Essential oils are a staple in my home retreat where I relax, practice yoga and meditate. They’ve become an integral part of my self care. Essential oils have also become my signature as a yoga teacher. I use them at the end of every class with a soothing neck and shoulder massage or maybe a refreshing chilled essential oil washcloth. Lately my favorite is a lovely balance and grounding blend that welcomes the seasonal change. These are great combinations! You’ve got the perfect blends that’ll work for everyone. Can’t wait to try a few on my own! The pumpkin spice blend sounds so yummy! I love all the fall scents! Great pick! I have heard that Ginger essential oil is good for cold and many other things. I would love to buy one this time. A WALK IN THE WOODS and FALL LEAVES have to be my favorite blends. I love the Patchouli and the Frankincense. Love these varieties of fragrances. I am now tempted to try at least a couple of them. Great picks! I love the sound of pretty much all of these, but especially the spiced cider, gingerbread, and apple pie! I’ve been delving more into essential oils. 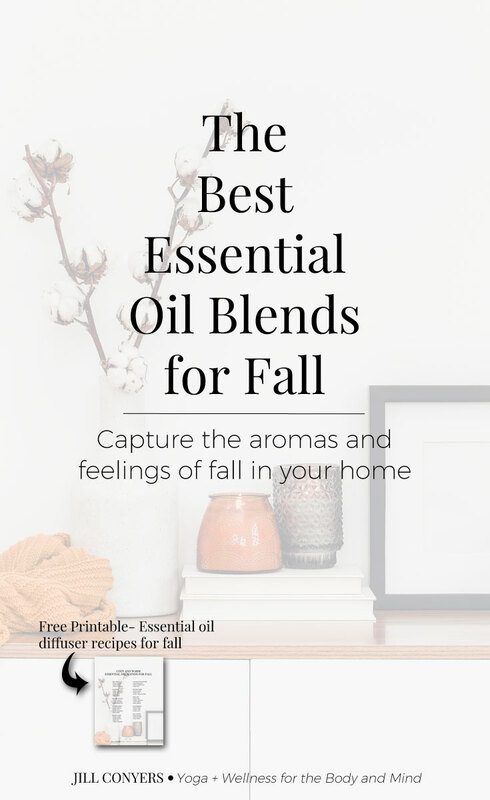 Thanks for this oil blend list–perfect for Fall! Love Love Love this!!! I just bought a defuser a month ago and I think it is the best thing ever! Can’t wait to try these out! The smell of fall is my favorite! Although I love using candles for my home, I do love a good diffuser blend. So I’ll be pinning this. Fall Spice and Apple Pie sound like HEAVEN! I’m definitely going to look into getting myself a diffuser and some EOs this fall. So many great health benefits! I haven’t tried using essential oils but I really think that I need them. Thanks for the recipes for the blends. I’m going to try them! I love using essential oils for so many things. I can’t wait to try some of these blends! I love Frankincense and clove! I can’t wait to try these combinations – I totally agree about coming home to a retreat too! I’m so trying these! I never know good blends to try. Oh thank you so much!!!! I’m always looking for good blends!! Oh I totally need to stock up on my essential oils! I love love love putting together different mixes, this is just what I need for this time of year. Wisconsin is so gloomy right now and a wonderful essential oil blend just makes everything better! Bergamot is one of my favs, I can’t wait to try these mixes out!